Explore ALTAI’s staff is made up of absolute professionals. They go to great ends to ensure that your trip goes smoothly. Each staff member has been hired for their commitment to the environment, traditional culture, their love of the outdoors, and their efficiency. And, to experience the magic that drives our company, they join Explore ALTAI on a regular basis. Unuruu has over 10 years experience in the travel industry. Unuruu was born beyond of Altai Mountains, Western Mongolia. He completed Mongolian Law University. He is travelling around the world last 6 years. Unuruu and his team work hard to ensure that your memories of Mongolia will be ones you will treasure for a lifetime. Mongolia, a country with centuries of rich history, has kept its nomadic lifestyle and inherited its unique traditions in line with modern development trends of the World. Explore with us MONGOLIA’s inimitable nomadic lifestyle, exquisite cultural heritages, fascinating traditions, stunning vast landscape and modern face of the country. He speaks English, Turkish, Khazah and a little bit of Tuvan. Bulgaa was born and raised in Western Mongolia’s Altai Mountains, a remote area of vast wilderness. 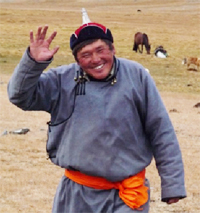 Growing up in a family that has lived a traditional Mongolian nomadic lifestyle for countless generations, Bulgaa’s connection to the land and his culture is innate. 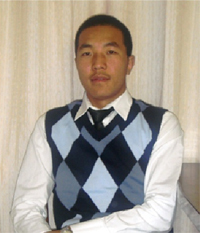 After completing high school Bulgaa ventured to Ulaanbaatar, the capital city of Mongolia, to study Tourism Management at the National University of Mongolia (NUM). For more than a decade Bulgaa has worked in all facets of the tourism industry, as a guide, a tour company manager, and an independent tour operator. Continuing his education, Bulgaa is now a lecturer and Ph.D student for Geography and Natural Conservation at NUM. While his work and studies bring him to all parts of Mongolia, he makes his home in Ulaanbaatar with his wife Anhaa and their children. He is well suited to be responsible for the overall management and strategic direction of Explore ALTAI. Bulgaa welcomes anyone who wants to experience one of the oldest and richest cultures in the world, and would be happy to answer any questions you may have. 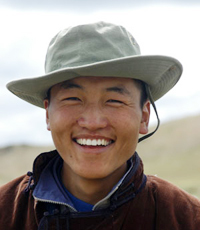 Jaga is also a native of the Altai Mountain region of Western Mongolia, and has guided trekking, mountaineering, biking, horse riding and fishing trips there and across Mongolia since 1999. He is especially skilled at alpine trekking and mountaineering, and has summited many of Mongolia’s tallest peaks, including Khuiten Uul, the highest peak in Mongolia and meeting point of Mongolia’s border with Russia and China. 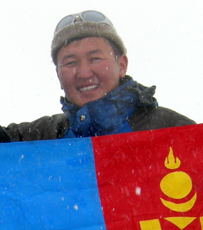 While working as a guide, Jaga simultaneously earned a degree for Interpreter and Tourism Management from the Bridge International College in Ulaanbaatar. 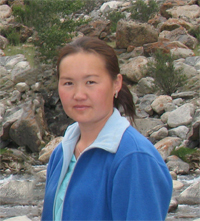 Upon graduating in 2006, Jaga rose to become the Manager of the largest tour company in Western Mongolia, eventually leaving to co-found Explore Great Altai Tours and Expeditions. He lives in the town of Ulgii in Western Mongolia with his wife Puje and their children. Gana is a locally grown, Tuvan. Joined our team in 2006 and is the quintessential local guide and coordinator. Gana’s calm demeanor and solid backcountry awareness is unmatched and his resume of Crown of Altai expeditions is both lengthy and impressive. 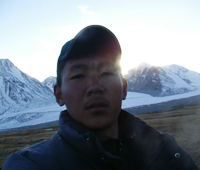 Gana is a lives in Tsengel village, Bayan-Ulgii province, with his wife and children. Zelme is joined our team in 2010 and he has excellent computer and software skills and is a person responsible for maintaining and developing company’s websites. His duties include ensuring that the web servers, hardware and software are operating correctly, designing the website, generating and revising web pages, and updating tours and contents to the websites.